It is one of those days when I want to write and share a recipe with you but couldn’t focus. Does this happens with you too? And when? I have so many things to share, everything is organized too – I have planned how to proceed, maintained a planner – just that I need a motivation or something like that! Heat oil in a wok, add hing and zeera. Saute for 10 seconds. 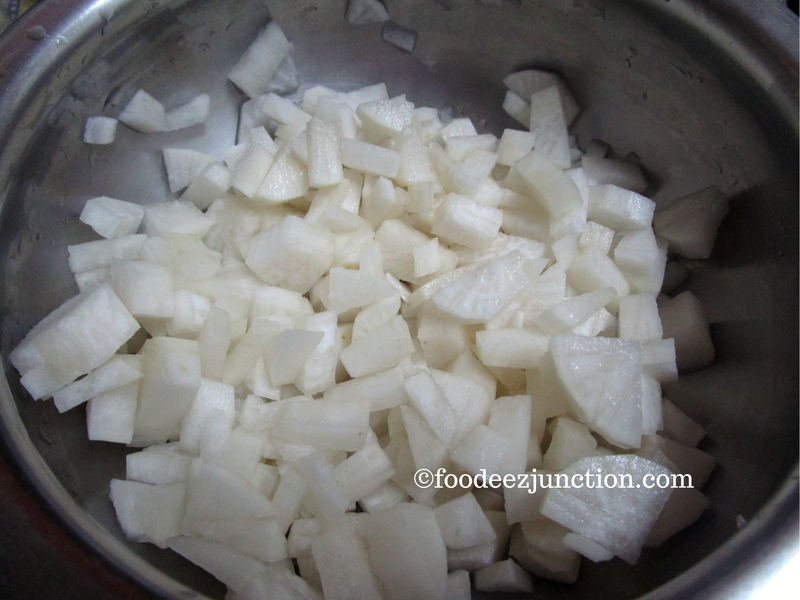 Add onion slices and fry till golden. Add green chillies and mooli pieces. Saute for a minute. Cover the lid of the wok and let it cook for 10 minutes. Open the lid and fry on low flame till the oil separates. Peel Radish, cut into halves vertically. Cut each halve again, vertically. Now chop each halve portion, horizontally; not too thick nor too thin. That’s it. Now, let’s hop on to cooking the sabzi. In a wok or kadhai, heat mustard oil. Add hing and zeera to the hot oil. Let zeera splutter for 10 seconds, do not let them burn. Add onion slices and fry till golden. Now add green chillies and fry for 4-5 seconds. Now add the chopped mooli to the wok, mix it with onion slices. Saute for a minute. Close the lid of the wok for 10 minutes and let it cook. No water is required. If you see radish sticking at the bottom, just sprinkle some water. Ideally, it should not stick, as radish leaves water while cooking. Check if the radish pieces have turned soft. If they are soft, open the lid and saute fry the sabzi for 5-7 more minutes or till the fat separates from the mooli ki sabzi. Once done, take it out in a serving tray and have with parathas or roti. And write to me how it was when you make mooli ki sabzi at home. Don’t forget to like and follow us on Facebook/Instagram/Twitter. If you liked the recipe, save it on Pinterest in your easy recipe magazine. Disclaimer: This post may contain affiliate links for the products that I recommend. If you buy those items through the links we will earn a commission; it will help us in running our food blog Foodeez Junction.